To save Motambo’s life, he was confiscated from the traffickers and PALF ensured that Motambo was taken to the Jane Goodall Institute’s Tchimpounga sanctuary. All of the chimpanzees living at JGI’s Tchimpounga sanctuary experienced trauma before coming to the sanctuary, but the injuries inflicted on Motambo by his captors were some of the worst we had ever seen. When Motambo arrived at Tchimpounga, we weren’t sure if he would survive. Little Motambo, only five years old, was suffering from gashes, missing teeth and broken bones. Worst of all, he couldn’t move his limbs or even open his mouth to eat or drink due to a severe tetanus infection gripping his tiny body. We believe that the infection was caused by a wound from a snare trap, which likely ensnared Motambo as he walked along the forest floor next to his mother. Motambo received intensive, round-the-clock care from the veterinary staff at Tchimpounga and stayed in the hospital ward for two months as he recovered. When it was time for him to be integrated with other chimpanzees, Motambo was still weak from his ordeal and was having trouble using his left wrist, which was broken when he arrived. Because of this, the staff put Motambo in an enclosure with La Vieille, an older female chimp who was always gentle and caring with new arrivals. Motambo got along well with La Vieille, and with the younger chimpanzees that eventually joined their little group. He loved to play with the youngsters, and would act the big brother, ending squabbles and protecting the smallest from the larger, more rambunctious chimps. Last year, Motambo’s life changed once more for the better when he was transferred to Tchibebe Island, one of Tchimpounga’s new island sanctuary sites. 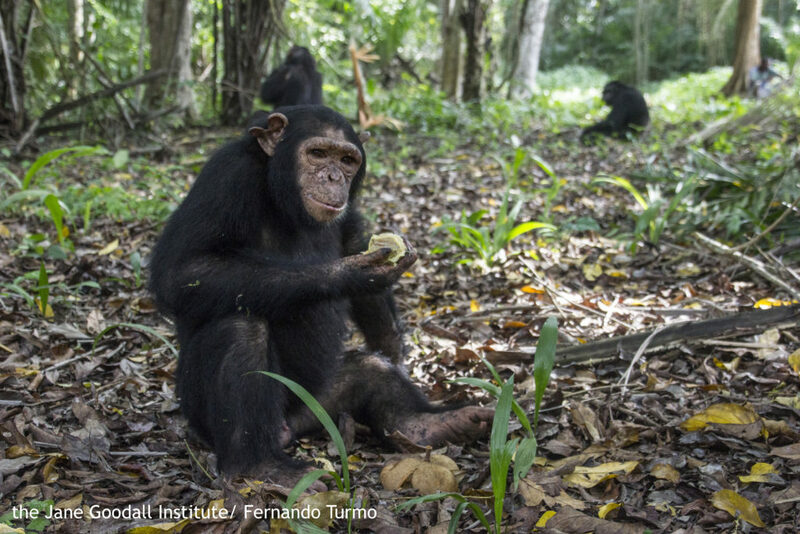 Today Motambo is able to roam the forested island with his chimpanzee friends, able to live freely on the island. Internationally, chimpanzees like Motambo and other great apes are used as props in television, film, circuses, roadside attractions, as pets and as social media share-able content. This cruel business removes chimps from their mothers at an early age, puts them into torturous training programs, asks them to perform unnatural acts, and eventually tosses these beautiful, highly social and perceptive animals aside when they are too large or aggressive to manage. Become a Chimp Guardian: To become a Chimp Guardian and support chimps like Lucand Motambo, rescued from the pet and entertainment trades, click here. Sign the Petition: You can help #StoptheShow by using your voice to protect chimpanzees and other animals and prevent them being put into harmful situations in the name of “entertainment.” Sign our petition and share with your friends, family and loved ones! Get the T-Shirt: Did you know we share 98.6 % genetic material with chimpanzees? 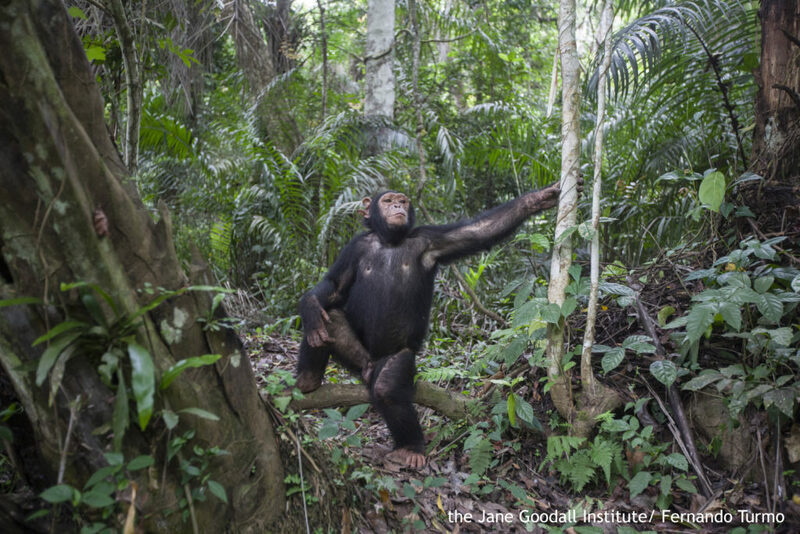 We believe chimps should remain wild and free and not be used in the entertainment industry. Show you do, too: http://bit.ly/2rkhblf . All proceeds benefit the Jane Goodall Institute’s programs to keep chimps wild and free + rescue chimps orphaned by the illegal pet/entertainment and bush meat trades.